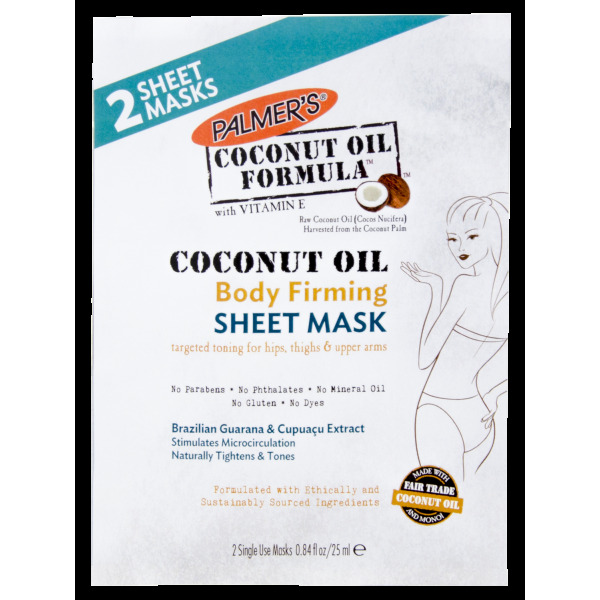 Delivers a powerful dose of firming ingredients in a sheet sized mask to fit the body's curves and contours. Crafted with Brazilian Guarana Extract, Cupuaçu Butter and sustainable Coconut Oil. This potent ingredient blend helps improve microcirculation and skin texture, resulting in a firmer, toned and smoother appearance. 96% of women tested* found that their skin appeared firmer and more toned after incorporating this sheet mask into their daily skin care regime. The sheet mask delivery system allows for optimal penetration of ingredients and excess product can be massaged into target areas for added hydration. Use on clean, dry skin. Carefully remove first mask from pouch and unfold completely. Leave on for 10 minutes. You may feel a cool, tingling sensation. Discard mask(s) and massage excess product into skin. 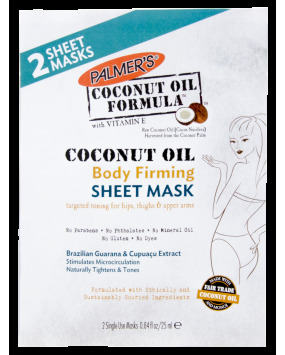 For better results start by applying Palmer's Coconut Oil Body Firming Sheet Mask then follow by applying Palmer's Coconut Oil Firming Body Lotion all over your body. *each pouch contains 2 sheet masks for simultaneous treatments. If only using one, place the pouch with extra mask in a sealed bag to prevent evaporation until ready to use. Crafted with Brazilian Guarana Extract, Cupuaçu Butter and sustainable Coconut Oil. Brazilian Guarana and Cupuaçu Butter - Helps improve microcirculation and skin texture.